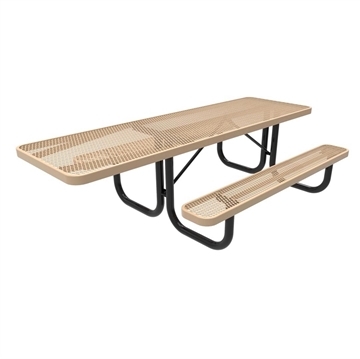 ADA Wheelchair Accessible Y-Base Picnic Table Perforated Thermoplastic Steel, 8 foot Rectangular, Surface Mount / Portable, 385 lbs. Our Thermoplastic coated picnic tables are one of the most popular designs in the market thanks to their durable and vibrant coating allowing for years of use in outdoor exposure. These picnic tables utilize expanded steel and perforated steel to create styles that are easy to clean, colorful, and UV resistant. Our Thermoplastic tables are perfect for outdoor dining areas in schools, universities, employee dining areas, and the parks and recreation areas where people gather to picnic and enjoy the outdoor dining. 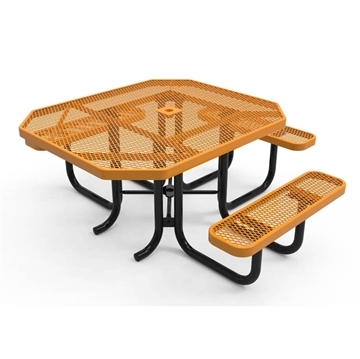 Picnic Furniture's Thermoplastic coated steel picnic tables are proudly manufactured in the USA with a 5-year warranty provided. Call our friendly staff today for additional information on quantity pricing or a quote request. Where are thermoplastic picnic tables most frequently used? 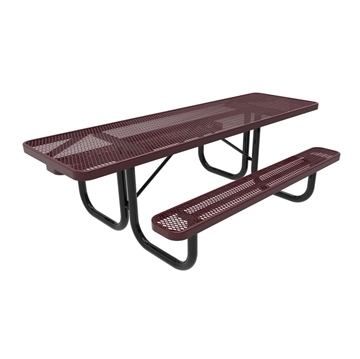 Public or private schools can use these tables for outdoor dining or projects purposes. 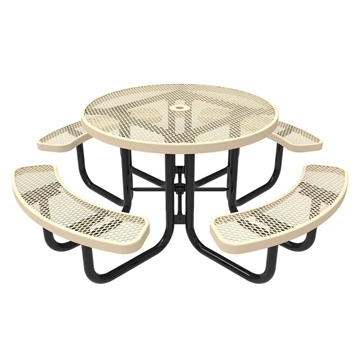 Thermoplastic Picnic tables are durable, long lasting, and will comfortably seat people looking to relax outdoors. Theft is rarely an issue as the average weight of the Thermoplastic table is 200 lbs.